I made this delicious Strawberry Frozen Yogurt recipe awhile back and was worried the strawberry season might be over before I had a chance to share on Just One Cookbook. 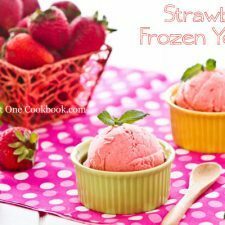 I am glad that there are still plenty of strawberries in the stores so you definitely have to try this recipe if you love homemade fruity frozen yogurt. 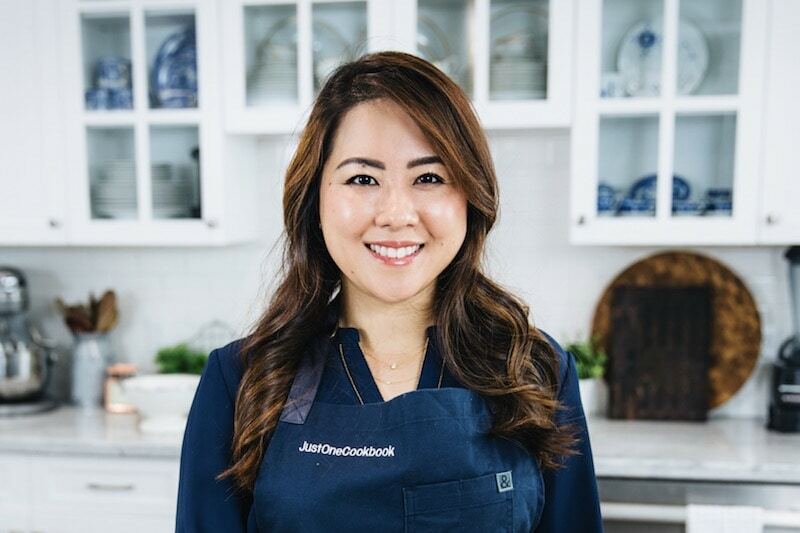 When I saw this recipe at Lynna’s blog, Hearts in My Oven, I knew I have to make it for my family since my daughter loves strawberry. 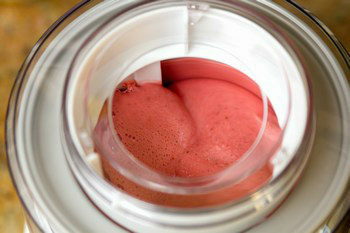 Compared to the Blueberry Frozen Yogurt, the texture of the strawberry frozen yogurt was really smooth and creamy. It didn’t get icy at all even being stored in the freezer for over a week. I used organic strawberries (really sweet and flavorful!) and the end result was very popular among my children and their friends. I’d highly recommend using organic strawberries if you can still find them. 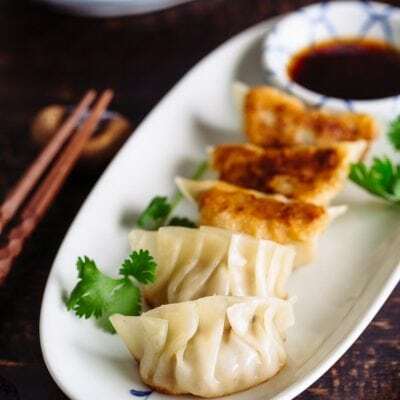 The best part about this recipe is that it’s super easy to make!! This Strawberry Frozen Yogurt is my last frozen treat I’ll share this year. I am really proud that I used my ice cream maker quite a bit this summer creating frozen treats for the family. In the middle of the summer, I was a bit worried that I might have shared too many ice cream recipes. Hope you enjoyed my ice cream posts! 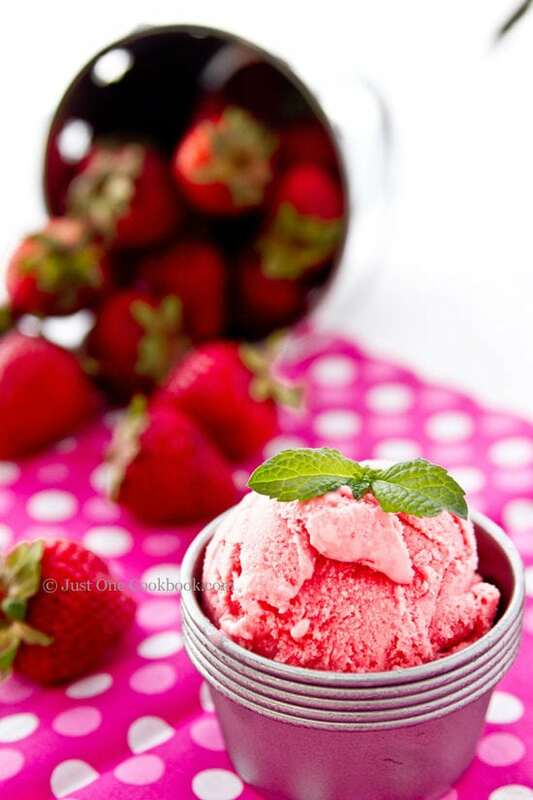 Easy homemade strawberry frozen yogurt made with organic strawberries, creamy and refreshing summer treat. Rinse the strawberries under cold water and use the point of the knife to remove the hull out of the tops. When you have big strawberries, cut them in half. 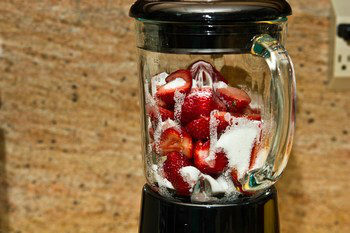 Blend strawberries, sugar, lemon juice and salt in blender until well combined. Add yogurt and sour cream and blend until well combined. The color is beautiful! And taste I imagine also great! strawberry season is over for me. they just disappeared when I wasn’t looking! 🙁 but I think I’ll give this a try with blueberries! It looks so creamy and delicious! Love berry yogurt. What a beautiful dessert! Yes, I’m so glad I can still find strawberries at the store….but then since my blender broke down a few weeks ago when I made my kids’ favorite smoothie…I don’t have a blender to make this frozen treat. 🙁 Guess I better go replace it soon. I love strawberry! I still see a lot of Australian strawberries around and definitely love to try this yummy dessert for sure. What a delightful light strawberry dessert? Ingredients are things we normally have and all you need is the fresh strawberries. My family would love it. Thanks for sharing. The color tell it all,looks perfectly YUMMY !! I just love this yogurt ice cream! I’ve been using homemade yogurt for so many recipes! Strawberry season will begin shortly here and I can’t wait to try it! Your photos are a feast for the eyes! Better make good use of those strawberries while still around! Perfect way to enjoy them. Nami, you are rite, this sounds very easy. Sigh…times like this, i really wish i have a icecream maker haha but since i dont have one in the first place, i shall try this with the manual way 🙂 love your food styling, always so pretty and creative, i always learn some new ways from your photos. 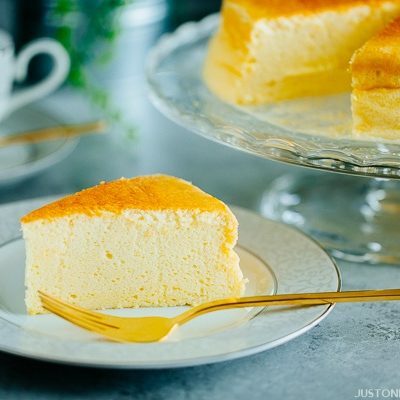 This is such a creamy fantastic recipe! Makes me feel cooler just looking at the pictures. 🙂 Hope you’re having a great week Nami! Don’t be afraid that you have posted too many ice cream recipes. I’ve enjoyed every one of them! You definitely are more talented in the dessert department than you think you are, and I wouldn’t mind seeing more frozen dessert recipes, even in the winter! Some of your ideas may even end up in our restaurant’s dessert menu. This is a perfect ode to summer Nami. I enjoy all of your posts seasonal or not. I also appreciate how conscientious you are about the timing. the color is so gorgeous, i wish it was still in season here, i miss having fresh strawberries in my smoothies in the AM. this will have to be bookmarked for next spring. I would’ve eaten it straight from the blender! 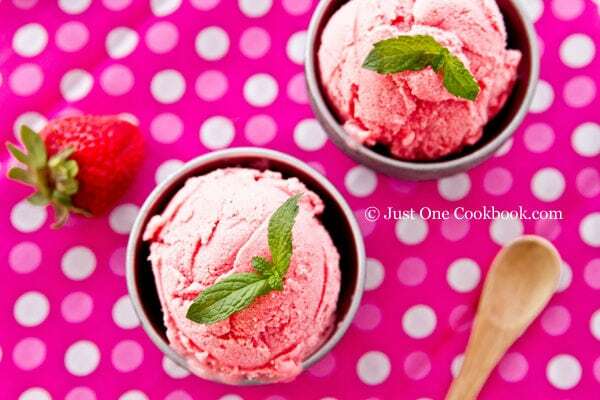 I love the colour of strawberry desserts, especially ice creams and yoghurts. They’re usually my favourite flavour. Love how beautifully yours came out. I should really make an effort to dust off my ice cream maker…maybe. Oh I eat ice cream even in the winter time so this is not late for me at all:) Tasty recipe, great styling and wonderful pictures Nami! You done it again!!! Nice shots by the way! So easy yet so delicious! My kiddos love frozen yogurt too! The pictures are beautiful– yum strawberries!! I can still see strawberries in the stores but they are very expensive! I shall just admire and drool over your lovely yoghurt 😀 It is indeed very creamy and looks like ice-cream! Between the pictures of the frozen yogurt and the strawberries themselves … a very tempting frozen treat to end the summer with. This just looks so beautiful and refreshing. 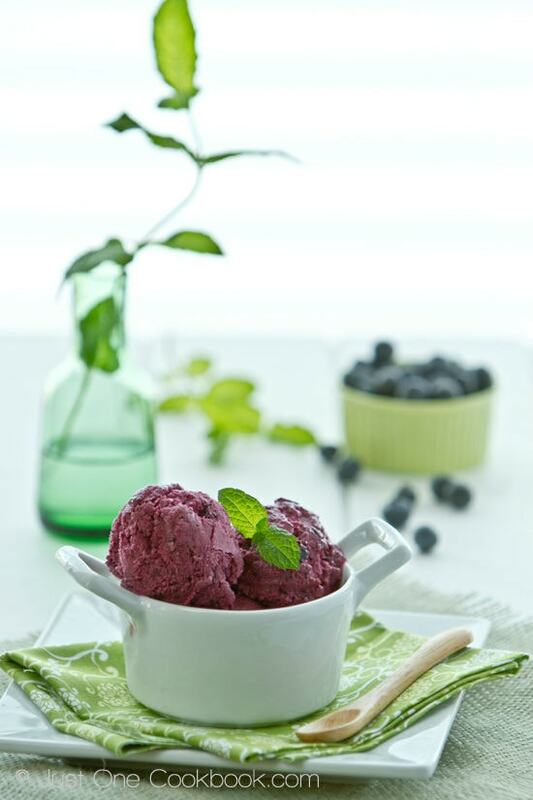 Isn’t it funny how easy it is to make homemade ice cream and frozen yogurt? So many people think it is really time consuming, when it’s not. Thanks for breaking it down and inspiring people to give it a try! Hope you are doing well. Thought of you this weekend when I was visiting a friend in Half Moon Bay. Had great sushi at Sushi on Main. Take care! 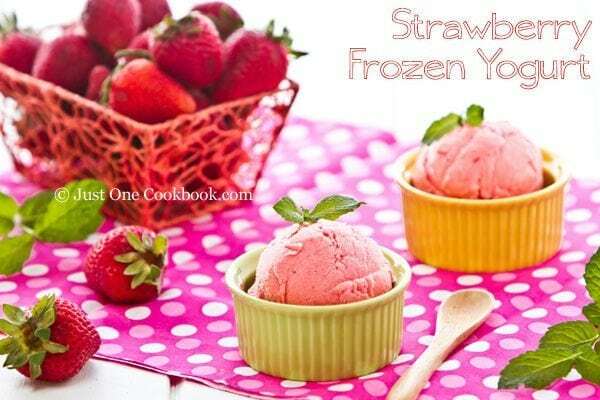 I love how you gave us a step by step process of this strawberry frozen yogurt. It looks easier than it seems. And of course, your photos are amazing. Now I’m going to go the store and get some more strawberries. Don’t worry about the timing – no matter what time of the year, we always find strawberries in the supermarkets. Thanks for sharing this, Nami! Hope your summer was good. Have a fun back to school week! 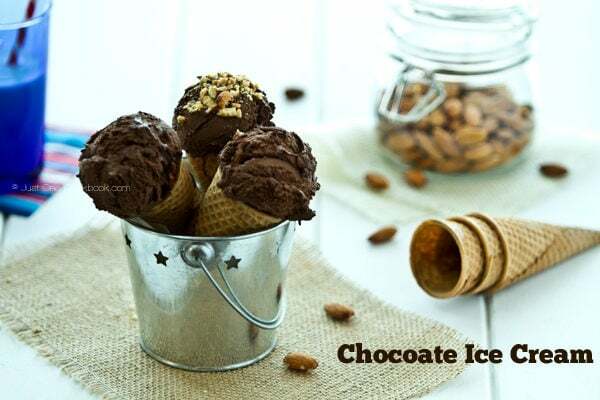 never get tired of icecream recipes Nami! love this, probably could use other fruit as well…although that looks utterly delicious! Beautiful photos, Nami! You done it again! I’m so happy to hear this strawberry yogurt can be made without an ice cream machine. =) The fiance will love this…he likes all things strawberry. We’ve got a hot week this week and my kids would love to dive into this! I did not use my ice cream maker as much as I wanted to this year. But, it’s still hot and we still have time! 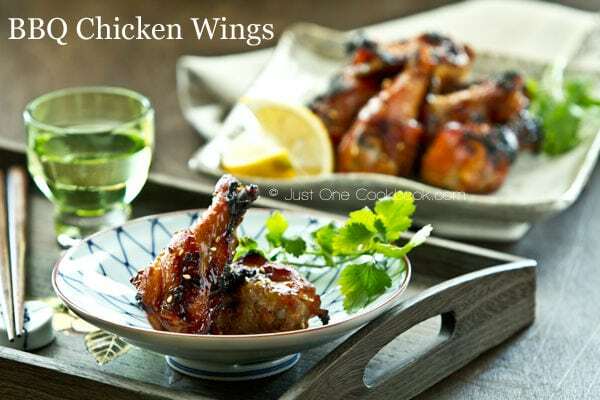 Nami, this is one beautiful post, the colors are outstanding and the recipe sounds delectable. So glad that you added the Strawberry Frozen Yogurt to your blog, since there are still late season strawberries available around here, and since I have not stashed away my ice cream maker yet, this will be a perfect “end of summer treat” for the family. Love your step-by-step instructions too – so gald that I am not the only one who did a “strawberry post” at the end of August. Mmmmm! I love all the fresh strawberries that summer gives us, and I love then even more in this form 😉 lovely job! I’m in love with frozen yogurt! 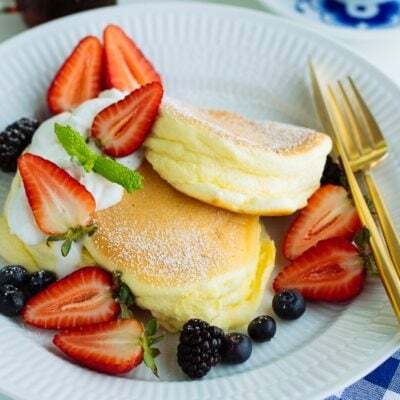 This is so beautiful with the fresh berries and just perfect for the holiday weekend! 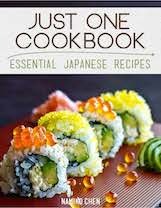 What a great, easy to make recipe. Looks so tasty! Going to keep this recipe on file for when our strawberries come ripe in the spring. I am a huge fan of frozen yogurt. The flavor of the good stuff just can’t be beat, even by ice cream in my opinion. 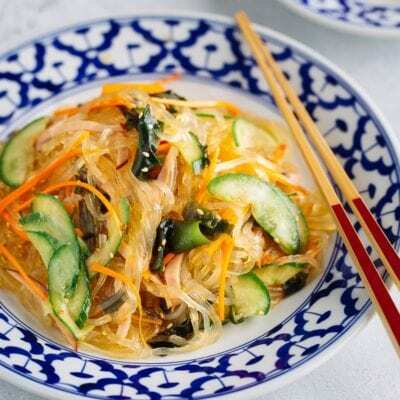 This recipe is fresh and delicious; quite the treat. Oh…no Nami, don’t do this to me…!!!! You know what, I finally found an ice cream maker in sale, hope I can still find one this weekend, I really need one…!!! Your blender step is genius. Delicious looking ice cream! Look amazing Nami I love berries frozen yogurt! delicious!! Oh yum! This would get my attention for sure! Chopinandmysaucepan won the Cuisinart ice cream maker and the flavor they want to make is sour plum ! We’ll have to watch for that one. 🙂 It’s already in the mail so I hope they make it soon. I love strawberry yogurt Nami, the thing is that my little one does not like it yet, I guess his taste buds need some time to welcome new flavors. I love strawberries and this looks amazing! 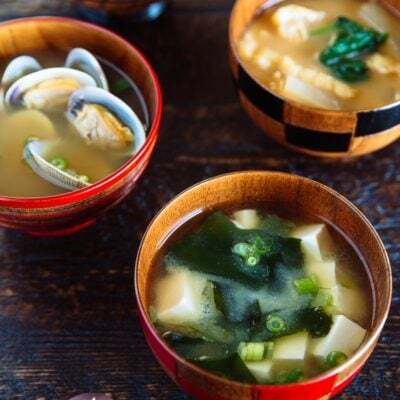 Just so good – i am craving some right now. I would have thought the strawberry one would be icier, given how much more watery it is than blueberries! What a nice girly pink it is! Out of all the ice-cream recipe you shared this summer I beat you to this one! I make strawberry frozen yogurt weekly since it’s the only “ice-cream” Tiffany can have. Just like cookie dough I sometimes am tempted to bypass the final step. Why bake the cookies when the dough is so delicious and why freeze the ice cream/sorbet when the unfrozen form can just be drank and be just as good. This is definitely one of those frozen dessert that might not make it to the ice cream maker. 🙂 I hope you and your family have a wonderful Labor Day weekend! i love your ice cream recipes! i’m hoping to try out your black sesame this week. the sour cream seems like an interesting and tasty addition to this recipe! What a great easy recipe 😀 I love strawberry yoghurt, its def my fave. Yum! Looks beautiful and light. On the East Coast strawberry season is usually the month of June, but my strawberry plants got a second wind and are now giving me small berries again. Just tiny ones here and there, but the taste is superior to any berries you buy the rest of the year. I also take a lot of time to complete a blog post, but I’m always so impressed at how much you post and have ready! Great colour, I bet it tastes delicious, I seldom use sour cream and never in ice cream, I wonder if it changes the taste much. Never apologise for posting a yummy sweet treat like this, Nami. It looks so fresh, fruity, fantastic! Nami, I totally agree: let’s enjoy the marvellous seasonal fruit and refreshing ice-cream or frozen yogurts as long as we can. This frozen yogurt looks so appetising, I have just added strawberries to my weekend shopping list! Looking at the mixing stage I’m not sure I would go to the end of the preparation process 😉 A part would probably be drunk as a smoothie. I love the photos and the bold choice of coulours you have used. You are a real magician! No complaints from me, darling! It’s ALWAYS summer in Cayman 🙂 I smiled real big when i opened this post. Your ice cream is so pretty! Warm or cold season, in my house, my son and I would eat any frozen treats. I guess that’s what you call “like father, like sone.” Haha! So, this recipe even if you post it in January, I would still make it. I love, love, love the color coordination of your photos. Sometimes, simple colors complimenting each other makes the photos pop. Really good job, my friend! Have a great Labor Day weekend! Yay, another frozen yogurt recipe! 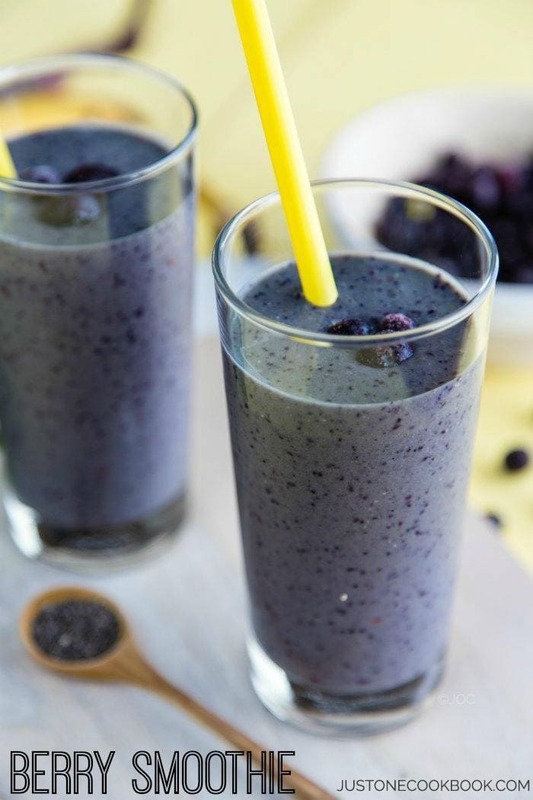 I was going to try your blueberry one tonight but I think I’ll have to make this first! For me any time of the year is ice cream time. And there is a lot of snow where I live lol. This looks like a fabulous frozen yogurt. Strawberries are around all year but out of season they are awful. Not to late now to get the last good ones. I actually never used my ice cream maker this summer 🙁 I kept making popsicles instead. But I’m definitely thinking of making this since I should use it as least once before summer ends! A month is not long. I was going through my drafts the other day and realized I have backlogs as far back as a year ago! :O …..then when I want to try writing, it is so hard to remember what I wanted to write about whatever I have cooked/prepared a year ago :O Horrid. Its not late, we have plenty of local strawberries in the market and its still summer. Moreover, I can eat ice cream even in winter sitting by the fireplace. Looks wonderful.! I totally understand what you mean about worrying about posts not being published in time, that happens to me all the time! No need to apologize! Ice cream recipes are great YEAR-ROUND! And… strawberries are on sale! 😀 Have a great long weekend! I like the addition of sour cream here, it’s perfect with the strawberries. 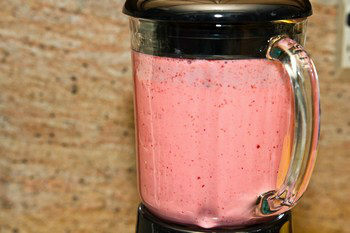 I’ll definitely have to give this a whirl sometime–looks fabulously cool, creamy, yummy and PINK!! Love the colours and the vibrancy of the ice-cream…it’s so appetizing. I want a big bite of it now! Have a great long weekend, Nami! how gorgeous it is and it is our strawberry season now so perfect timing! After all of those ice creams now its yogurt. Now I am badly craving for some. What a lovely color. 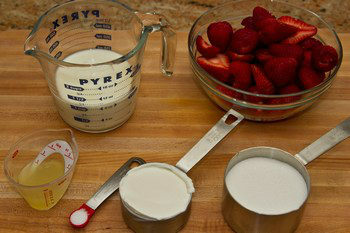 Strawberry season is passed here, but I hope to make some strawberry frozen yogurt next year – looks delicious! Beautiful recipe and it’s officially spring in Sydney now so we can start to indulge in more of these things! Ice cream is never out of season! Besides, it’s Labor Day weekend – a big ice cream eating time! Love the second picture – really gorgeous. It’s just perfect. That pretty pink colour captures my eyes immediately! What a scrumptious summer treat! Strawberries are in season right now – and this is so easy to make:) Yum. Nami, you have given mme the incentive I need to get myself an ice-cream maker. I don’t think I can get through the summer without making this! Well, you know that I’m a big fan of frozen treats. This is right up my alley and it needs to go right into mah belly! YUM! Love it!!! especially because yogurt and strawberrys are a totally delicious. Wow!! I don’t have an ice cream maker but I shall try the stirring method! 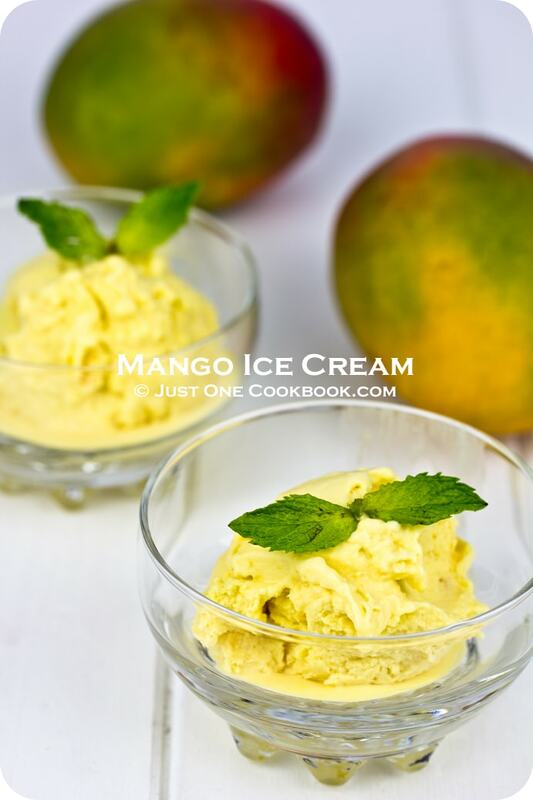 Frozen yoghurt is preferable to ice cream and this one looks great even with a simple recipe! It may be late in the season, but ice cream is always in season for everyone:) I also take a long time to prepare my posts, don’t really know why though, lol:) Glad you shared this Nami, thanks! I love making ice cream but have been so lazy this summer. This looks so pretty and I am sure tastes fab! Nami, I always love your frozen treat photos! 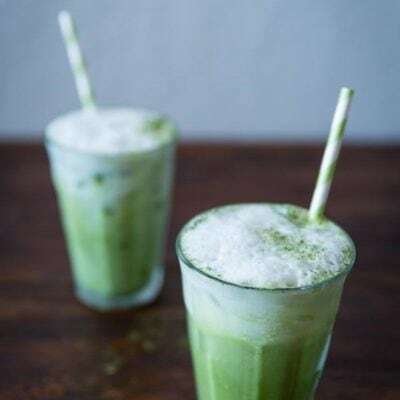 I have to admit, I’m a bit intimidated to photograph ice cream and popsicles most times because I feel rushed to get the shot before it melts 🙂 I love this recipe, I will be trying this for sure! I just tried this and it came out fantastic! As others mentioned, it almost didn’t make it to the ice cream maker, and even then, I couldn’t stop eating from the machine. Beautiful colour, too. Thanks for posting! Hi Jennifer! I’m glad you enjoyed this frozen yogurt! Yay~! I know, it’s so hard not to sample or test the flavor while it’s being in the process! 😀 I’m happy you enjoyed it! Thanks for your feedback! 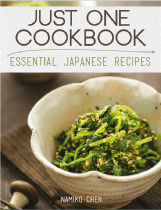 This is awesome.my friend chatted me saying to see your blog and now I am almost reading all the recipes and stories. Thanks for sharing! 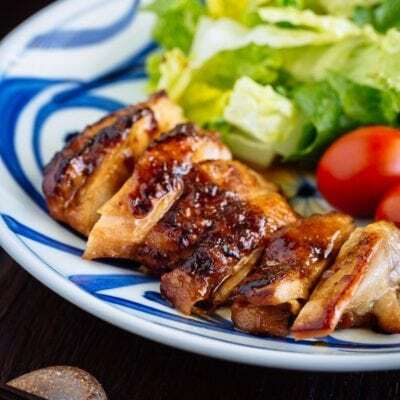 This is an amazing recipe, Love and like to eat it. The color is stunning. 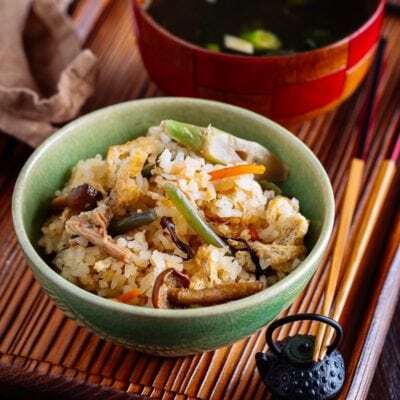 Like to become your follower, Keep sharing such kind of recipe. Thank you for sharing.